Pain is defined as "an unpleasant sensory and emotional experience associated with actual or potential tissue damage, or described in terms of such damage" by the International Association for the Study of Pain (IASP). Besides, pain is also a complex sensory pathway which is essential for survival. The mechanisms of the nervous system that detect stimuli having the potential to cause tissue damage are indispensable to trigger behavioural processes that protect the tissue against current or further damage. Amongst others, these stimuli include strong mechanical forces, temperature extremes and exposure to chemicals or oxigen deprivation. In general, pain can be divided in two categories: acute or chronic. Typical characteristics of acute pain are a sudden onset and a duration of less than six months. Its underlying pathology can often be easily identified, since acute pain is well localized and defined through its association with tissue damage. Furthermore, acute pain normally subsides with tissue healing. In contrast, chronic pain extends beyond normal recovery time and persists after the normal healing process occured. It may or may not signal continued tissue damage, and is often associated with activation of dysfunctional neuro- logical or psychological response. Many patients suffering from chronic pain have a long history of treatment failures (i.e. medication was tried with no effects) and show common side effects such as depression, anger, frustration, decreased activity level or decreased sleep. But pain can also be classified according to the sort of damage that causes it. The two main categories are then nociceptive pain caused by tissue injury and neuropathic pain, which arises due to nerve damage. Typical subcategories as well as characteristics and mechanisms are listed in Table 1. A widely discussed third category is psychogenic pain, which often has its origin either in tissue or nerve damage, but the pain caused by that damage is increased or prolonged by psychological factors such as fear, depression, stress, or anxiety. Cases where pain originates only from a psychological condition are rare. To understand the physiology of pain, the easiest way is to follow the nocicep- tive signal pathways from the sensory receptors to the brain. Special attention needs to be paid to the integration and modulation of the nociceptive signal at different steps in the Central Nervous System (CNS). While pain refers to the perception of a feeling, nociception (lat. nocere, "to hurt") refers to the sensory process that is triggered. Noxious stimuli such as strong mechanical forces or temperature extremes are detected by so-called nociceptors, which transduce these stimuli into electrical signals. The signals are then conducted through the primary afferent nerve fibres to the dorsal horn of the spinal cord. There, the primary neurons make a synaptic contact with the secondary neurons, which immediately cross in the spinal cord and then form the spinothalamic and spinoreticular tracts. Through these tracts the projections are sent to the thalamus, where the afferents subsequently make a second synapse. The tertiary neurons lead to the somatosensory cortices, which are involved in the sensory quality of pain including intensity, duration and location. A nociceptive stimulation initializes a cascade of events. First, a bunch of pro-nociceptive inflammatory substances including potassium, bradykinin, histamine and substance P will be released into the periphery near the injury (Table 2). These lead to hyperalgesia, i.e. an increased sensitivity to pain that can be measured as a lower pain threshold in and around the lesion. Next, free nerve endings called nociceptors will be activated by the noxious stimulus. They transduce the stimuli to electrical signals which will then be passed on through the afferent nerve fibers to the dorsal horn of the spinal cord. Increasing diameter and myelination boost the conduction velocity of the stimulus towards the spinal cord. The Aδ-fibers conduct the nociceptive signal relatively rapidly, which is why they are responsible for the nociceptive reflex (e.g. you pull away your hand very fast if you touch something hot) as well as the sharp localization of pain. In contrast, C-fibers have a slow conduction velocity (no myelination, small diameter) and therefore lead to a dull aching, non-localized and longer lasting pain. Combined sketch of the signal pathway from the periphery all the way to the cortex. Only the pathway via the spinothalamic tractis shown due to simplification. The afferent nerve fibers have a first synaptic contact with secondary neurons in the dorsal horn of the spinal cord. In addition, both non-nociceptive and nociceptive afferents have at this junction a synaptic interaction with an important network of exitatory interneurons and pain neurotransmitters including substance P or glutamate. These modulate the nociceptive signal before it is projected to superior centers of the CNS. The secondary neurons travel up the spinal cord along two main pathways: the spinothalamic and the spinoreticular tract. Both decussate to the contralateral side of the spinal cord within a few segments of the level of entry. While in the spinothalamic tract the secondary neurons ascend directly to the thalamus, the neurons in the spinoreticular tract synapse again in the reticular formation before leading to the thalamus. The reticular formation is located in the brainstem and is involved in a wide range of functions including attention and conciousness. Therefore it is believed to affect changes in the level of attention and the emotional reactions in response to pain. Pain can only be experienced when nociceptive signals reach the cortex. Therefore, the neurons that come upwards along the spinal cord synapse a last time in the thalamus. From there, tertiary neurons guide the nociceptive information to differents structures in the cortex: the somatosensory cortices (SI and SII) are mainly involved in the sensory discrimination of pain, while the anterior cingulate cortex (ACC) and the insular cortex (IC) are associated with the affective components of pain. In the somatosensory cortices, both the nociceptive and the normal somatic sensory information converge on the same cortical area. Therefore, information on the location and the intensity of pain can be processed to become a localized painful feeling. This cortical representation of the body is described in Penfield’s homunculus. Pain is a dynamic phenomenon perceived differently by every human being. The reason for this is, that the nociceptive signal is not only transmitted to the cortices but also modulated at multiple levels within the CNS. This modulation includes excitatory and inhibitory mechanisms from the brain stem, the autonomic nervous system, and the cortical structures responsible for the emotional (ACC and IC) as well as cognitive (SI and SII) aspect of pain. superior center effects that will either modulate descending mechanisms or change the perception of pain by reinterpreting the nociceptive signal. When only C-fibers are signalling, inhibitory interneurons are impeded, the gate is closed and only noxious signals are forwarded along the secondary neuron (projection neuron). When also Aβ-fibers are firing, inhibitory interneurons will be activated. The gate is opened also to non-noxiuos stimuli and the signal of the C-fibers is weakened. Neural "circuit diagram" of the gate control theory. Inhibition is represented in blue, and excitation in yellow. A lightning bolt signifies increased neuron activation, while a crossed-out bolt signifies weakened or reduced activation. The gate control theory was developed by Melzack & Wall in 1965. It suggests tha pain can be inhibited at the first synapse, i.e. between primary afferent fibers and secondary neurons at the spinal cord level. When C-fibers are firing, they do not only pass the noxious signal on to the secondary neuron, but also impede inhibitory interneurons. This is interpreted as the gate being closed and only noxious signals are forwarded. On the other hand, if Aβ-fibers are firing, they excite the inhibitory neurons. Therefore, the activation of the secondary neuron is not limited to nocious signals, which is interpreted as the gate being opened. Depending on the realtive rates of firing between C-fibers and Aβ-fibers, the pain signal is blocked. A well-known example of the gate control theory is, that pain sensation after hitting your elbow decreases when you rub it. Its advantages are that it is not noxious and no medication is needed, while it is leading to immediate pain modulation. However, as soon as the high frequency stimulus that activates the Aβ-fibers is gone (i.e. as soon as you stop rubbing you elbow), also the pain level will not be diminished anymore. Already for a very long time it has been known that opium and its derivatives such as morphine and heroin are painkilling. In the 1960s and 1970s, their receptors were found, predominantely in the periaqueductal gray matter (PAG) and the rostroventral medulla (RVM) in the brainstem as well as in the spinal cord. This implied, that similar chemicals are produced by the nervous system to modulate pain endogenously. Serotonin and norepinephrine are the main transmitters of the descending inhibitory nerve system. These inhibitory pathways then recruit interneurons in the spinal cord to produce a pain-relieving response over the rest of the body, which is also known as counter-irritation. Examples for this kind of modulation are not only numerous painkillers, but also massage, acupressure, and acupuncture. In the latter two the endogenous system is triggered by additional pain, which is why they are usually only used after trying other options to modulate pain. It has been shown, that cognitive manipulations such as distraction, hypnosis or expectation influence pain perception of individuals. Furthermore, it has also been confirmed that suggestion of pain intensity can change the brain activity related to pain perception. These results support the idea that placebo effects can adapt the performance of endogenous pain modulation. Phantom limb pain and sensation are inextricably linked. However, they are not the same and it is therefore important to distinguish them from one another. Phantom limb pain is variable and can be described as burning, stabbing, or throbbing sensations, among others. Moreover, very complex pain sensations can occur, for example the feeling of twisting in the phantom limb, or of fingernails digging painfully into the palm of the phantom hand. The majority of individuals experience phantom limb pain after amputation, with a prevalence ranging from 55 to 85%. In many cases there is pain at the stump as well as in the phantom limb, making it difficult to distinguish one from the other. Over the last decades many clinical studies on phantom limb pain and sensation have been carried out, outlining some common tendencies among patients suffering from the syndrome. Regarding frequency, phantom pain is continuously present in a subset of patients, while in others it tends to occur episodically in the form of pain attacks. However, even in these cases, a continuous pain can also exist in between. The pain attacks can last from a few seconds to up to several hours. In rare cases, patients can experience the episodes over several days. Climatic conditions: 59%. This includes a 55% due to weather, 1% due to the season and 3% due to the ambient temperature. Cognitive Factors: 3%. Examples of cognitive factors are fixing attention on the phantom limb and observing the injury. The reason why these factors trigger phantom pain will become clear in the next section. In accordance with the fact that phantom pain is considered a multifactorial pain syndrome, and current theories on the pathophysiology of phantom limb pain are usually separated into peripheral, central and psychological components. These three areas are strongly interconnected. Neuromas are formed from the regeneration of the surviving proximal nerve section and can generate abnormal discharges that cause the persistence of the pain. In fact, in several studies, evidence of hyperactivity in the stump muscles was found when compared to the contralateral limb. This hyperactivity was present in the form of slight twitches in small fiber bundles or even spasmodic contractions of the entire stump. The fact that pain is not eliminated by conduction blockage of peripheral nerves, as well as the fact that pain can still persist even after ectopic discharges in the peripheral nerves are eliminated through pharmacotherapy or surgery, proves that phantom pain is a complex mechanism not solely due to the development of neuromas. In fact, there are some additional peripheral mechanisms involved in phantom pain: blood circulation effects and sympathetic activation. Under low temperatures our sympathetic nervous system is stimulated, causing vasoconstriction in skin, arms and legs. This in consequence leads to hypoperfusion in the stump, which can increase the activity of nociceptive nerve fibers and thus reinforce the sensation of pain. This is due to both ischemia and the cooling of neurons. These vascular mechanisms are the reason why weather is one of the main triggers of phantom pain. Furthermore, a connection between brief, strong increases in muscle tension in the stump and subsequent phantom pain episodes has been established in several studies. Mechanical pressure and strong muscle contraction may also have perfusion effects, which in turn could aggravate the pain. Moreover, perfusion effects may also appear as a consequence of some foods and drugs like coffee, explaining their pain triggering nature. The main theory to explain phantom pain in the context of the central nervous system is the neuromatrix theory. The neuromatrix includes the cortex, especially the primary somatosensory cortex and the posterior parietal lobe, the thalamus, and the limbic system. Functional specialization of the brain. Vectorized image by Jkwchui, via Wikimedia Commons. Labeled for reuse. While the neuromatrix hypothesis can be useful for describing the origin of pain, it does not explain why relief of phantom sensation rarely alleviates phantom pain, why the sensation can suddenly go away, or why not all amputees experience phantom limb pain. Therefore, other possible explanations must be taken into consideration. In addition to the hyper-responsiveness, and possibly as a consequence, after an amputation changes in the cortical representation of the body, take place. These changes are generally observed after deafferentation, and are particularly pronounced in the primary somatosensory cortex. 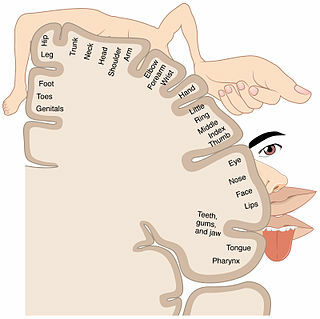 Sensory Homunculus by OpenStax College, via Wikimedia Commons. Labeled for reuse. Drawing based on the MRI of an adult whose right arm was amputated below the elbow at the age of 11 years. Therefore, the right hemisphere shows the normal organization of the cortex. In red is depicted the primary somatosensory face area, while in green is depicted the hand area and in blue the upper arm region. In the left hemisphere it can be seen that the face (red) and upper arm (blue) regions have extended into the expected hand territory (green), reflecting reorganization of the sensory map following amputation. Based on the work of V. S. Ramachandran and W. Hirstein, “The perception of phantom limbs. The D. O. Hebb lecture”. In case of heavy or prolonged nociceptive stimulation the previously mentioned central sensitization may occur also in the dorsal horn neurons of the spinal cord. This can lead to an increased spontaneous activity and increased responsiveness to non-noxious stimuli  , thus prolonging the pain long after the noxious stimuli are present. Illustration of mirror therapy. Modified from 'Obesity and BMI' by BruceBlaus, via Wikimedia Commons. NSAIDs are used to treat mild to moderate pain, such as headache, sprains or toothache. NSAIDs are anti-inflammatory, which makes them also effective for treating injuries or conditions such as arthritis and postoperative pain. NSAIDs work by the function of COX-2 inhibitors. They directly target cyclo-oxygenase-2 (COX-2), an enzyme that produces prostaglandin which is responsible for inflammation and pain. They have also been shown to have positive effects in reducing the occurrence of cancers and pre-cancerous growths as well as in suppressing inflammatory neurodegenerative pathways in mental illnesses as in depression and schizophrenia. However, they have severe side effects. NSAIDs significantly increase heart attacks and strokes. Ibuprofen belongs to the group of the NSAIDs. It stops the production of prostaglandins by inhibiting Cyclo-oxygenase COX-1 and COX-2. It is used to treat pain, fever and inflammations. Its half-life is between 1 to 3 hours. Naproxen is a NSAID that is used to treat pain, fever and inflammations and is with 8-12 hours relatively long active. Acetylsalicylic acid is a NSAID that belongs to the group of the salicylates. It treats pain, fever and inflammations and inhibits the aggregation of thrombocytes. It’s mechanism is according to the one of the NSAID’s. Acetylsalicylic acid is used to treat fever and pain of different causes. Usually, it is used to treat acute pains like headache, toothache, pain coming from joints, tendons or the back, but also fever and pain from a cold. It can also be used to prevent the formation of thromboses when used daily in low doses. Paracetamol is also known as Dafalgan ® or Panadol ®. It is derived from Acetanilid, which was in 1880 one of the first medications against fever that was launched. Paracetamol is used to alleviate pain and reduce fever. In contrast to the NSARs, it doesn’t combat inflammations and does not inhibit the aggregation of thrombocytes. However, it is also involved in the blocking of the prostaglandin synthesis. Its half-life period is about 2 to 3 hours, which is rather short. Its effect lasts around 4 to 6 hours. Possible application areas are: headache, toothache, muscular and joint pain, pain after surgery or in context with fever and flue. Metamizole is a (not acidic) analgesic and belongs to the group of the pyrazolones. It is a prodrug which in the body becomes biotransformed into different active metabolites. Metamizole can be used to treat pain, fever and spasms. Because of its spasmolytic properties, it is often used to treat colics. Its mechanism is not yet fully understood. Possible drug targets are cyclo-oxygenases and cannabinoid receptors. Opioids play an essential role in pain management especially for moderate to severe pain. They are used for acute pain, in palliative care and pain treatment of degenerative conditions. Morphine is the prototypical opioid. Opioids interact with opioid receptors which are G-protein coupled receptors that are mostly found in the brain and spinal cord but also the gastrointestinal system and in other tissue. By binding of the opioid to the opioid receptor the Gprotein is activated which leads to inhibitory effects on cAMP production, Ca2+ influx and K+ efflux that result in hyperpolarization of the cell and reduction of neuronal excitability. In the spinal cord opioids inhibit the release of substance P from primary sensory neurons reducing the transfer of painful sensations to the brain. In the brainstem nociceptive transmission is modulated by opioids. Antidepressants are used in the treatment of neuropathic pain and fibromyalgia. The analgesic effect does also show in non-depressed patients, so they do not only work by improving a depressive state that can accompany chronic pain. Examples for antidepressants with analgesic effects are tricyclic antidepressants (TCA) and serotonin noradrenaline reuptake inhibitors (SNRI). Antidepressants have no nociceptive effect but act on the locus coeruleus and bind to noradrenaline, which is involved in intrinsic control of pain. The exact mechanism, however, is still unclear. Antiepileptic drugs are used for treatment of neuropathic pain. There are several different ways antiepileptics relieve neuropathic pain. For example, older antiepileptic drugs such as phenytoin and carbamazepine which is mainly used for trigeminal neuralgia, work by reducing neuronal excitability by means of frequency-dependent blockade of sodium channels. Deep brain stimulation (DBS) has been used for the treatment of chronic pain since the early 1970s. DBS shows favorable results for the treatment of chronic pain, including failed back surgery syndrome (FBSS), phantom limb pain, and peripheral neuropathic pain with a higher response rate for those with nociceptive pain compared to neuropathic pain. It also shows promising results in cephalgia, with cluster headaches carrying the best success rates. In some states, marijuana can be medically prescribed. It often comes to use as a treatment for chronic pain when no other drug is available. The effect of marijuana is mediated through the cannabinoid receptors CB1 and CB2. Still, scientific evidence is missing as the regulations for testing marijuana in people are very strict. Getting the clearance to work with THC is almost impossible. Allowing research on marijuana would help to identify the compound or combination of compounds that cause the adverse effects and develop a potent, effective and safe new drug. To get around the restrictions, some scientists are investigating an alternative: the marijuana-like compounds produced naturally in the brain called endocannabinoids. They act on the neurons in a similar way as the cannabinoids and help regulate pain, appetite and anxiety. When molecules bind to the CB1 receptor, it leads to pain relief. Research is also done in the usage of positive allosteric modulators, PAMs, that increase the odds a signaling molecule, in this case endocannabinoid, will find its receptor, which is here the CB1 receptor. That way, PAM would only be boosting endocannabinoid signaling under conditions in which it’s already being released. ↑ a b c d Marchand, S. (2008), ‘The physiology of pain mechanisms: From the peripheryto the brain’, Rheumatic Disease Clinics of North America 34(2), 285-309. ↑ ScoreUSMLE (2015), ‘Spinal pathways made super easy (part 1-2)’, Youtube Video, (accessed 21.7.2015). ↑ a b Hasudungan, A. (2013), ‘Nociceptors - an introduction to pain’ (Explains the ascending pathway, very easy to understand), Youtube Video, (accessed 21.7.2015). ↑ Patel, N. B. (2010), ‘Physiology of pain’, Extracted from Kopf and Patel (Ed) „Guide to Pain Management in Low-Resource Settings“, 2010, International Association for the Study of Pain. ↑ Melzack, R. & Wall, P. D. (1965), ‘Pain mechanisms: a new theory’, Science 150, 971--979. ↑ Apkarian, A. V., Bushnell, M. C., Treede, R. D. & Zubieta, J. K. (2005), ‘Human brain mechanisms for pain perception and regulation in health and disease’, European Journal of Pain 9(4), 463-484. ↑ Goffaux, P., Redmond, W. J., Rainville, P. & Marchand, S. (2007), ‘De- scending analgesia – when the spine echoes what the brain expects’, Pain 130(1-2), 137-143. ↑ a b c d e f g h i j C. M. Kooijman, P. U. Dijkstra, J. H. B. Geertzen, A. Elzinga, and C. P. Van Der Schans, “Phantom pain and phantom sensations in upper limb amputees: An epidemiological study,” Pain, vol. 87, no. 1, pp. 33–41, 2000. ↑ a b c d e P. Jensen, T.S. & Rasmussen, Phantom pain and other phenomena, Textbook o. Edinburgh: Churchill Livingstone, 1994. ↑ a b c d e V. S. Ramachandran and W. Hirstein, “The perception of phantom limbs. The D. O. Hebb lecture,” Brain, vol. 121, no. 9, pp. 1603–1630, 1998. ↑ a b c d B. Cronholm, Phantom limbs in amputees: a study of changes in the integration of centripetal impulses with special reference to referred sensations. Stockholm, 1951. ↑ a b c E. Frank, B. & Lorenzoni, “Phantomerleben und Phantomschmerz. Fortschritte der Neurologie und Psychiatrie,” vol. 60, pp. 74–85, 1992. ↑ K. Sherman, R.A., Katz, J., Marbach, J.J. & Heermann-Do, Locations, characteristics, and descriptions. New York: Plenum Press, 1997. ↑ a b c d e M. Döbler, K. & Zenz, “Stumpf- und Phantomschmerz,” in Lehrbuch der Schmerztherapie, Stuttgart: Wissenschaftliche Verlagsgesellschaft, 1993, pp. 377–384. ↑ a b c d e C. Winter-Barnstedt, “Phantomschmerz nach Extremitätenamputation : Diagnostik und Biofeedback-Behandlung,” Ruprecht-Karls-Universität Heidelberg, 2001. ↑ S. W. Wartan, W. Hamann, J. R. Wedley, and I. McColl, “Phantom pain and sensation among British veteran amputees.,” Br. J. Anaesth., vol. 78, pp. 652–659, 1997. ↑ C. Sherman, RA, Sherman, “Prevalence and characteristics of chronic phantom limb pain among American veterans: results of a trial survey,” Am. J. Phys. Med., vol. 62, no. 5, pp. 227–238, 1983. ↑ a b c d e R. G. Bittar, S. Otero, H. Carter, and T. Z. Aziz, “Deep brain stimulation for phantom limb pain.,” J. Clin. Neurosci., vol. 12, no. 4, pp. 399–404, 2005. ↑ “Neuroma,” Wikipedia, 2016. [Online]. Available: Neuroma [Accessed: 05-Jun-2016]. ↑ a b W. Larbig, P. Montoya, H. Flor, H. Bilow, S. Weller, and N. Birbaumer, “Evidence for a change in neural processing in phantom limb pain patients.,” Pain, vol. 67, no. 2–3, pp. 275–283, 1996. ↑ a b R. A. Sherman, V. D. Griffin, C. B. Evans, and A. S. Grana, “Temporal relationships between changes in phantom limb pain intensity and changes in surface electromyogram of the residual limb,” Int. J. Psychophysiol., vol. 13, no. 1, pp. 71–77, 1992. ↑ M. M. Merzenich, R. J. Nelson, M. P. Stryker, M. S. Cynader, A. Schoppmann, and J. M. Zook, “Somatosensory cortical map changes following digit amputation in adult monkeys.,” J. Comp. Neurol., vol. 224, no. 4, pp. 591–605, 1984. ↑ T. P. Pons, E. G. Preston, A. K. Ommaya, H. K. Jon, E. Taub, and M. Mishkin, “Massive Cortical Reorganization After Sensory Deafferentation in Adult Macaques,” Science (80-. )., vol. 252, no. 5014, pp. 1857–1860, 1991. ↑ T. Elbert, H. Flor, N. Birbaumer, S. Knecht, S. Hampson, W. Larbig, and E. Taub, “Extensive reorganization of the somatosensory cortex in adult humans after nervous system injury.,” Neuroreport, vol. 5, no. 18, pp. 2593–2597, 1994. ↑ a b H. Flor, T. Elbert, S. Knecht, C. Wienbruch, C. Pantev, N. Birbaumer, W. Larbig, and E. Taub, “Phantom-limb pain as a perceptual correlate of cortical reorganization following arm amputation.,” Nature, vol. 375, no. 6531, pp. 482–484, 1995. ↑ a b H. Buchner, C. Kauert, and I. Radermacher, “Short-term changes of finger representation at the somatosensory cortex in humans,” Neurosci. Lett., vol. 198, no. 1, pp. 57–59, 1995. ↑ a b P. M. Rossini, G. Martino, L. Narici, A. Pasquarelli, M. Peresson, V. Pizzella, F. Tecchio, G. Torrioli, and G. L. Romani, “Short-term brain ‘plasticity’ in humans: transient finger representation changes in sensory cortex somatotopy following ischemic anesthesia,” Brain Res., vol. 642, no. 1–2, pp. 169–177, 1994. ↑ W. M. Jenkins, M. M. Merzenich, M. T. Ochs, T. Allard, and E. Guic-Robles, “Functional reorganization of primary somatosensory cortex in adult owl monkeys after behaviorally controlled tactile stimulation,” J. Neurophysiol., vol. 63, no. 1, pp. 82–104, 1990. ↑ A. Karl, N. Birbaumer, W. Lutzenberger, L. G. Cohen, and H. Flor, “Reorganization of motor and somatosensory cortex in upper extremity amputees with phantom limb pain.,” J. Neurosci., vol. 21, no. 10, pp. 3609–18, 2001. ↑ R. Chen, B. Corwell, Z. Yaseen, M. Hallett, and L. G. Cohen, “Mechanisms of cortical reorganization in lower-limb amputees.,” J. Neurosci., vol. 18, no. 9, pp. 3443–50, 1998. ↑ H. Flor, T. Elbert, W. Mühlnickel, C. Pantev, C. Wienbruch, and E. Taub, “Cortical reorganization and phantom phenomena in congenital and traumatic upper-extremity amputees,” Exp. Brain Res., vol. 119, no. 2, pp. 205–212, 1998. ↑ E. a Franz and V. S. Ramachandran, “Bimanual coupling in amputees with phantom limbs.,” Nat. Neurosci., vol. 1, no. 6, pp. 443–444, 1998. ↑ M. Calford and R. Tweedale, “Immediate and chronic changes in responses of somatosensory cortex in adult flying-fox after digit amputation.,” Nature, vol. 332, no. 6163. pp. 446–448, 1988. ↑ L. Arendt-Nielsen and S. Petersen-Felix, “Wind-up and neuroplasticity: is there a correlation to clinical pain?,” Eur. J. Anaesthesiol. Suppl., vol. 10, pp. 1–7, 1995. ↑ J. Li, D. A. Simone, and A. A. Larson, “Windup leads to characteristics of central sensitization,” Pain, vol. 79, no. 1, pp. 75–82, 1999. ↑ S. L. Florence and J. H. Kaas, “Large-scale reorganization at multiple levels of the somatosensory pathway follows therapeutic amputation of the hand in monkeys.,” J. Neurosci., vol. 15, no. 12, pp. 8083–8095, 1995. ↑ M. A. Nicolelis, R. C. Lin, D. J. Woodward, and J. K. Chapin, “Induction of immediate spatiotemporal changes in thalamic networks by peripheral block of ascending cutaneous information.,” Nature, vol. 361, no. 6412, pp. 533–6, 1993. ↑ “Phantom limb,” Wikipedia, 2016. [Online]. Available: w: Phantom_limb Phantom_limb [Accessed: 05-Jun-2016]. ↑ “Pain Management Health Center,” WebMD, 2015. [Online]. Available: phantom-limb-pain| [Accessed: 05-May-2016]. ↑ J. Foell, R. Bekrater-Bodmann, M. Diers, and H. Flor, “Mirror therapy for phantom limb pain: Brain changes and the role of body representation.,” Eur. J. Pain, pp. 1–11, 2013. ↑ COX-2 Inhibitors and Cancer: Questions and Answers.” 2004. National Cancer Institut. 2004. http://www.cancer.gov/cancertopics/factsheet/APCtrialCOX2QandA. ↑ Muller, Norbert. 2010. “COX-2 Inhibitors as Antidepressants and Antipsychotics: Clinical Evidence.” Current Opinion in Investigational Drugs (London, England : 2000) 11 (1). England:31–42. ↑ “Ibuprofen.” 2017. PharmaWiki. https://www.pharmawiki.ch/wiki/index.php?wiki=ibuprofen. ↑ "Naproxen.” 2017. PharmaWiki. https://www.pharmawiki.ch/wiki/index.php?wiki=metamizol. ↑ “Acetylsalicylsäure.” 2017. PharmaWiki. https://www.pharmawiki.ch/wiki/index.php?wiki=Acetylsalicylsäure. ↑ “Paracetamol.” 2018. PharmaWiki. https://www.pharmawiki.ch/wiki/index.php?wiki=paracetamol. ↑ “Metamizol.” 2017. PharmaWiki. 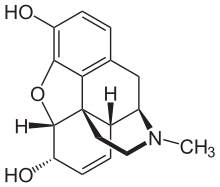 https://www.pharmawiki.ch/wiki/index.php?wiki=metamizol. ↑ Hemmings, H. C., & Egan, T. D. (2013). Opioid agonists and antagonists. In Pharmacology and physiology for anesthesia: Foundations and clinical application. Philadelphia, PA: Elsevier/Saunders. ↑ Obata, H. (2017). Analgesic Mechanisms of Antidepressants for Neuropathic Pain. International Journal of Molecular Sciences, 18(11), 2483. doi:10.3390/ijms18112483. ↑ Ryder, S., & Stannard, C. F. (2005). Treatment of chronic pain: Antidepressant, antiepileptic and antiarrhythmic drugs. Continuing Education in Anaesthesia Critical Care & Pain,5(1), 18-21. doi:10.1093/bjaceaccp/mki003. ↑ Falowski, Steven M. 2015. “Deep Brain Stimulation for Chronic Pain.” Current Pain and Headache Reports 19 (7). United States:27. doi:10.1007/s11916-015-0504-1. ↑ Fields, Douglas. 2014. “The Absurdity of ‘ Medical Marijuana .’” BrainFacts.org. 2014. http://www.brainfacts.org/thinking-sensing-and-behaving/diet-and-lifestyle/2014/the-absurdity-ofmedical-marijuana. ↑ Burrell, Teal. 2017. “Smoking Out the Therapeutic Possibilities of Cannabinoids.” BrainFacts.org. 2017. http://www.brainfacts.org/thinking-sensing-and-behaving/diet-and-lifestyle/2017/smoking-out-thetherapeutic-possibilities-of-cannabinoids-42017.